You’re pregnant, can you drink eggnog? Traditionally, eggnog was made with raw eggs, which is not good for pregnant women due to the health concerns of salmonella. Salmonella causes salmonellosis, a kind of food poisoning that can be dangerous during pregnancy. However, currently, the U.S. Food and Drug Administration (FDA) restricts the use of raw eggs to less than 1% in products. If you’re buying eggnog at the store, be sure to check the ingredient label to ensure it is egg-free or contains less than 1% egg product. Also, it is important that your eggnog be pasteurized. Pasteurization is a heat process that destroys salmonella that might be in eggs. Use egg substitute products or pasteurized eggs. If you are using pasteurized eggs, the FDA recommends starting with a cooked egg base to ensure your safety. To make a cooked egg base, combine eggs and half the milk as indicated in the recipe. (Other ingredients, such as sugar may be added at this step.) Cook the mixture gently to a temperature of 160°F, stirring constantly. The cooking will destroy Salmonella, if present. At this temperature, the mixture will firmly coat a metal spoon. After cooking, chill the mixture before adding the rest of the milk and other ingredients. 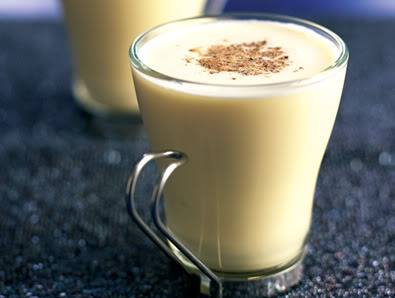 You can keep your eggnog holiday traditions, but remember to read all the labels on eggnog containers or carefully prepare your homemade eggnog.